The following article, written by Edward J. Bernacki, M.D., M.P.H., is an excerpt from an article to be published in the December issue of The Self Insurer, based on a research study conducted. As I mentioned, previous studies have generally equated long-term opioid therapy with increased claims costs and lost work time, particularly when the opioids are prescribed beyond three months post-injury. 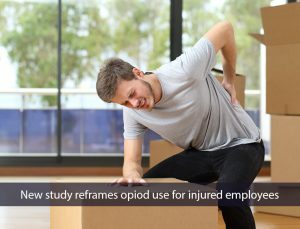 So, we wanted to conduct another study that would take a closer look at the relationship between how long-term opioid use affected the outcome of workers’ compensation claims. Those employees who were not prescribed any opioids as part of their therapy (4,463). The opioid costs of the claimants whose prescriptions extended three months and more, compared to those prescribed opioids for less than 30 days, were significantly higher ($8,618 vs. $94), as were the average total cost per claim ($81,510 vs. $21,539). However, the data indicated that opioids did not independently account for this cost disparity. In fact, opioid costs accounted for less than 4 percent of the average total claims costs, although this cost increased up to 14 percent for the long duration claims. The higher cost of long-term claims presumably was due to the increased number of provider visits, medical treatments (including physical therapy, injections, and surgery) and medical surveillance costs required for employees with more severe underlying injury. Cost aside, the most unexpected finding of our study is that almost all (over 98 percent) of the claimants—even those receiving opioids for more than three years—were released to work safely while continuing their opioid therapy. In fact, it’s plausible that for someone recovering from a particularly severe injury, well-managed long-term opioid therapy may actually facilitate their return to work. There is evidence that long-term opioid use for some individuals can reduce pain and improve functionality without any cognitive impairment. Of course, employees and employers need to be aware that sustained opioid use might impact an employee’s cognition and safety. For this reason, the employee taking opioids should continue to be monitored closely by an experienced practitioner. Our finding—that long-term opioid use, in and of itself, does not preclude an employee’s ability to work—revolutionizes how we think about managing pain after an employee sustains a workplace injury. Although there has been much debate about the opioid prescribing epidemic in the United States, our study suggests that physicians do not automatically need to limit their opioid therapy to 30 days or less after injury and that employees can be returned to work safely while taking chronic opioid medications, as long as the prescriber is a trained and experienced clinician and the prescribing remains within the range established by the Centers for Disease Control and Prevention. Robert A. Lavin, M.D., M.S. Nimisha Kalia, M.D., M.P.H., M.B.A.
Edward J. Bernacki, M.D., M.P.H. Xuguang (Grant) Tao, M.D., Ph.D.
Click here to learn more about how onsite clinics can bring the best of Johns Hopkins health care directly to your workplace.